Summertime in Berlin!! Our top 5 of things to do in Berlin, all for FREE!!!! We want to keep our guests informed about what is cool and cheap to see and do in Berlin. 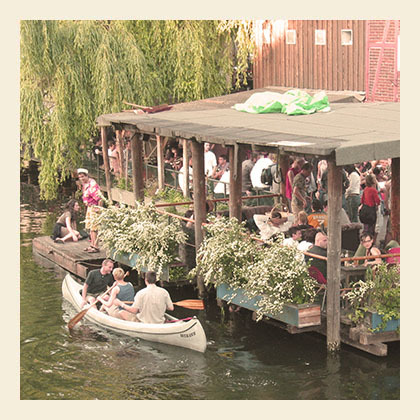 Some of our favorite low cost activities & events in Berlin our listed down below. Check it out and klick on the links for more detailed information on each of the activities. In case you want to have more tips and recommendations check out what our staff has to say online. Sunday is fleamarket day. Close to the hostel (500 m) you find the Arkonaplatz Fleamarket and the famous Mauerpark fleamarket. You don´t want to buy something – no problem you first of all go there to see all kind of urban subjects with hangover and even sober ones. Berliners go there – you should as well. Viktoriapark is one of Berlin’s oldest and prettiest parks and offers a great view from the top of Kreuzberg. Have a delicious and cheap vegetarian lunch at Seerose (Mehringdamm 47) and then have a coffee or some ice cream at one of the plenty cafes in Bergmannstraße. Kreuzberg/Viktoriapark @ U-Mehringdamm. Have fun exploring Berlin without spending to much money!! Hope to welcome you soon to the EastSeven Berlin Hostel!!! !